Have you ever looked at yourself in the mirror and thought, why did I eat that last donut? How does my husband even love me? Don’t get me wrong I love my body I am incredibly blessed to have an amazing body which has given me so much! But man I looked in the mirror and I just thought where the hell did you let yourself go… If you’ve been here this blog is probably for you. Its going to get personal, it’s going to get super ugly, and its going to be 100% raw. In 2013, My husband and I had our first big vacation together, a trip to Cancun for our friends wedding. All of my husbands friends and their wives are extremely good-looking people, who are fit and take good care of the body. I at the time was very uncomfortable in my body and wanted to look good in Cancun as they would be memories for us to share forever, I wanted to be able to look back on our pictures together and be proud. I hired a personal trainer/nutritionist and changed my body for the better. I took up a paleo diet as I had painful digestive issues at the time. Going paleo helped so much, I no longer had pain during digestion, I also noticed improvements in my mood, my skin and my overall attitude was much better when I wasn’t eating all the carbs. Working with the trainer allowed me to stay motivated, hold myself accountable and see improvements faster. I went from 158 lbs, on September 1st, 2013 to 145lbs, November 14, 2013 – i lost 13 lbs and 13 inches. I had never felt so incredible in my life, the confidence I had gained along with the knowledge was overwhelming. Fast forward to now and here I am, 3 and a half years later, a mom of a beautiful baby boy, who got pregnant after putting all that weight back on. My starting pregnancy weight was 154 lbs – aka my winter 10 (I always seem to fluctuate between 10lbs heavier in the winter). Before returning to work I had gotten back down to 159 – which was a huge accomplishment for me. But at work I sit at a desk, So I am not nearly as active as I was on Matt-leave. Since returning to work I have put on another 9 lbs. So here I am.. 168 lbs and completely bare to you all. Something I have struggled with discussing my whole life is my weight. Being a tall individual people generally don’t understand the placement of my weight, so telling you my weight makes me feel incredibly vulnerable. I asked my husband how much he thought I weight in the above picture, he said “120lbs”. This is a huge indicator that so many people have such a misconception on weight and body type. In the above picture, I weighed 145lbs. But I felt the best I had ever felt. My confidence was amazing and I felt healthy and fit, I went on to drop to 140 which for me was a healthy weight I could maintain. Getting pregnant is different for everyone, each person carries their baby different and therefore also carries their weight different. Some women can have a baby and only gain 2 lbs, and some woman get pregnant and gain 70 lbs. For me it was important to not gain too much weight, but it was also important that I didn’t stress over weight gain. I put on 34 lbs during my pregnancy, which was just within the healthy range for my body type (my body type should gain approx 25 – 35lbs during pregnancy). It was a huge accomplishment for me. I was able to continue my work out routine during pregnancy, I went to the gym until I was 7.5 months pregnant and then I signed up for fit for two prenatal work out. This was similar to an aerobics class that I would walk to and from. I also walked my dogs 3-4 times a day at the time as we lived in our condo. My diet was also 60% paleo at this time, I had started to consume carbs again as it was all that would hold off the nausea and my body was able to digest them again except for corn. When I first started eating carbs again this caused me to have a little carb overdose and I gained 8 lbs in 1 week. Which was extremely hard to swallow. So here I am 168 lbs, 20 months post baby and at a point in my life when I need to make this change to better my life. I had been wanting to start at the gym for a while but was used the excuse that I didn’t want to take time away from my son. Being a working mom it is always a struggle to find time for things for yourself without giving up that special time with your child. How do you balance motherhood and being happy in your own skin. This was/is my goal. Going to the gym gives me so much relief for my stress, my anxiety, it also gives me more confidence. So I decided to complete a 2 week trial at a local gym, I found a work out program that I used to do which is Jamie Eason’s live fit trainer – completed through http://www.bodybuilding.com. I have successfully completed my two-week trial and am ready to commit to this lifestyle change. Which means balance – making better choices but not giving my up my sanity. There will be days when I eat pizza pops because I don’t have food in my house. Or days when I am so exhausted that we may eat macaroni. I am not going to put pressure on myself or my family rather I want to just create a healthier routine for my family. So here is where this all plays into the blog. I am giving my commitment to change to all of you! I am ready to change my life and get healthy and start trying to get back to the old Chelsea. And I am going to share the challenges of this and the excitements with all of you, I am going to get really raw. I will not be making this a major focus of my blog rather I will post a check up of how I am doing and what changes I have made every few weeks. I wrote the majority of this blog, when I started my plan 2 weeks ago, But I have now finished my two weeks and am doing 4 lbs. By just exercising more, I plan to do some measurements this week so I can keep track of loss in inches as I build muscle I know that muscle weighs more so I may not lose a lot of weight but lose more inches! That is the goal, I will not let the scale control me rather I will use it as one part of this journey. I have yet to decide if my family will go back paleo or not, I would really like to however our little guy really enjoy his carbs and being paleo requires a lot more work in the kitchen.. I do hope to return to Paleo, but think we will wait till I am done breastfeeding. But again its all about finding a good balance. Follow my fitness Journal for updates and pictures on the progress! A side note I missed writing my blog last week, Life has gotten so crazy! With getting up at 4am and I am going to bed ALOT earlier. As well we have started our first BIG renovation, we are renovating our basement “rec room”. The people who lived here previously had allowed for this room to take on some tough times so we are re-vamping as well as fixing some wiring issues that our place had. I will be sure to keep you posted on the challenges we encounter and share some pictures along the way. 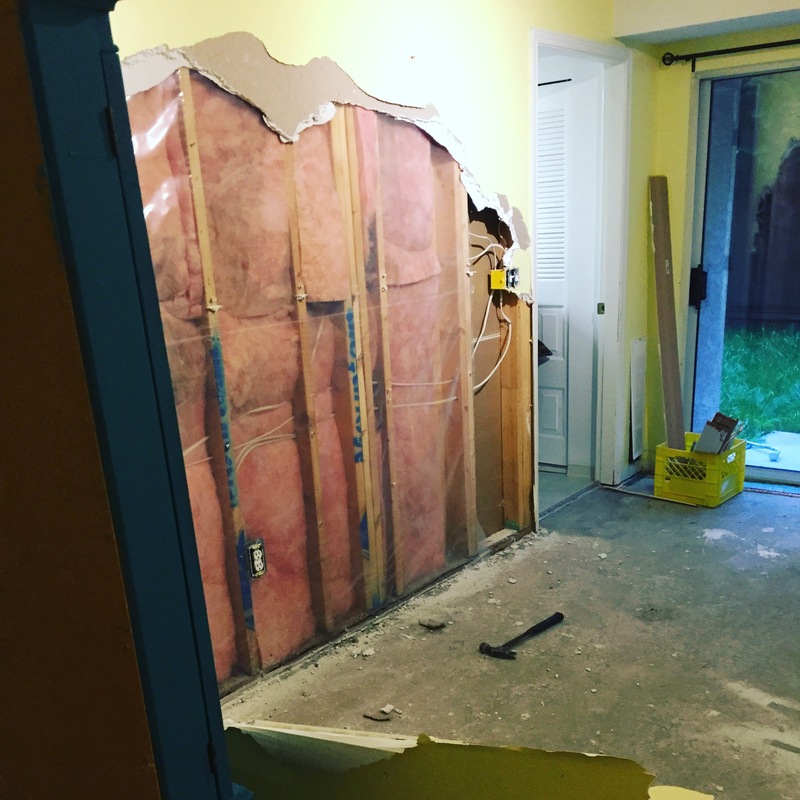 I know one challenge will be keeping my husband focused on sticking to 1 Reno, he’s much like his dad and wants to take on multiple projects when we should do 1 at a time! Thank you all for reading about my commitment and I hope that sharing this with you keeps me more committed to my goal! If you want to make a commitment to a change in your life and want some support I would love to help you with this! Just don’t over do it, do as much as you feel good with. Stay healthy.